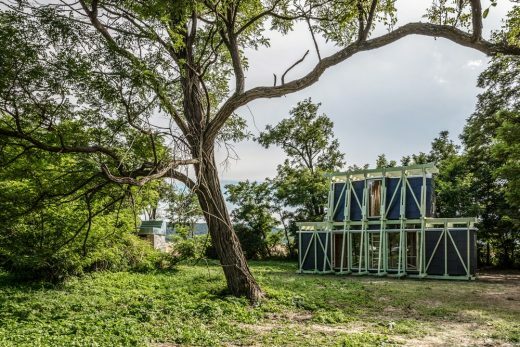 The seven tiny houses built in a week’s time under the theme Cabin Fever, include a wool-lined single cabin retreat, a party clubhouse for your friends, and a cabin on stilts. 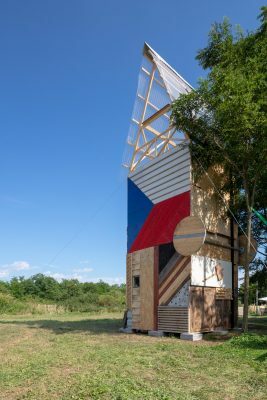 At this year’s Hello Wood International Summer University and Festival students got the chance to build seven contemporary cabins. 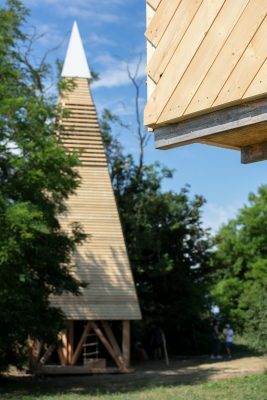 As part of the week-long Cabin Fever programme, participants were mentored by international architects – Hungarian AU workshop and Marton Low, Czech H3T architekti, Italian ZarCola, Spanish architect Josep Garriga and OfficeShophouse, Argentinian iR arquitectura and Swiss frundgallina – constructing tiny houses in a collaborative process. 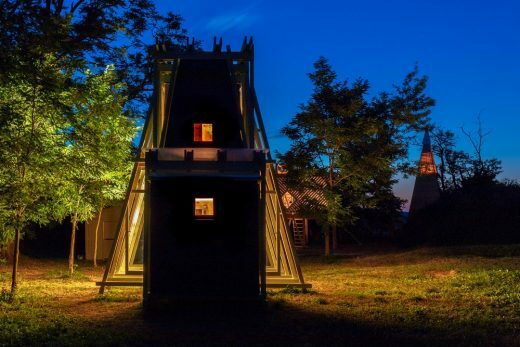 In the future, these moveable, liveable and unique wooden cabins could even become prototypes for boutique accommodation in popular weekend destinations. 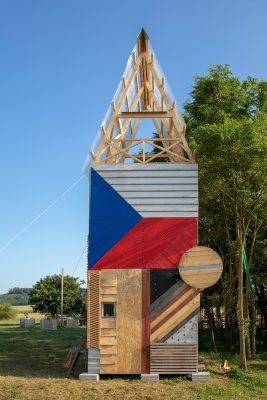 Hello Wood is a European offshoot of the Tiny House Movement and makes cabins which give urban dwellers the chance to get away from it all for a while. 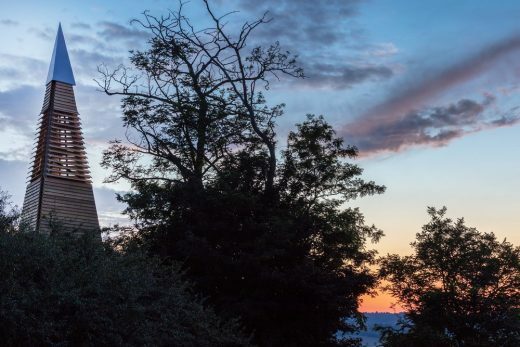 This is the ninth time that the Hello Wood International Summer University and Festival has been organised for architecture and design students. 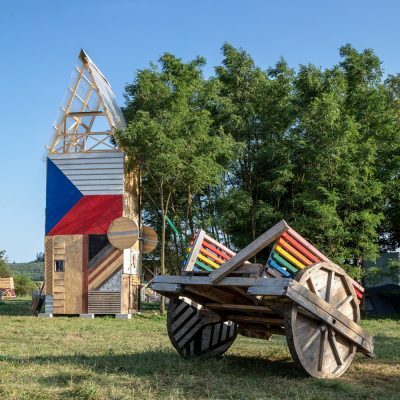 Hello Wood’s campus on a piece of nomadic land in the lush Hungarian countryside increasingly resembles a working village thanks to the efforts of students and architects arriving from 30 countries and 65 universities. The once uncultivated site has become interesting in terms of both architecture and design and has recently seen the arrival of tiny cutting-edge houses. 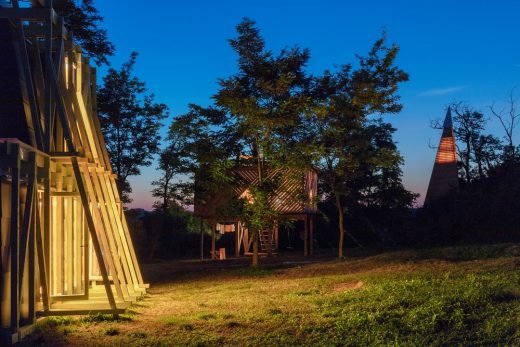 The buildings include the Hungarian AU workshop’s wool-lined cabin retreat, the Hello Wood forest clubhouse, the cabin on wheels by Czech H3T architekti, the 12-metre high Swiss frundgallina lodge, the multi-storey homes by ZarCola from Italy, the cabin on stilts by the Spanish architect Josep Garriga + OfficeShophouse, and the Argentinian iR arquitectura’s building that has the potential to become a passive house with the use of solar energy. The most important aspect of Hello Wood’s internationally-renowned, innovative teaching method is that students from all over the world are able to gain practical experience to supplement the abstract, overwhelmingly theoretical classes they have at the university. At this year’s camp, students were able to see first-hand how a 2D design drawing is used to create a real building. They also got to learn how to apply tin roofing, saw how good insulation works, and became familiar with the layers that make up the walls of the houses. Besides becoming acquainted with the building material and the values of teamwork, students also encountered innovative technological developments. For instance, LafargeHolcim Group, one of the largest cement producers in the world provided its new mineral thermal insulation material to the Hello Wood team, to gain experimental feedback at the early stages of going to market. 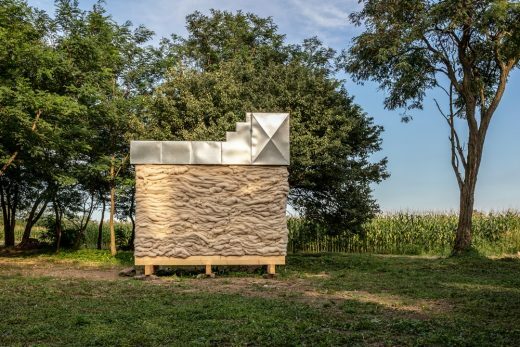 One of the groups was also able to see what it is like to build a cabin using pre-manufactured wall panels thanks to a local manufacturer, Berger Houses, which makes prefabricated houses using technology unparalleled in Hungary. 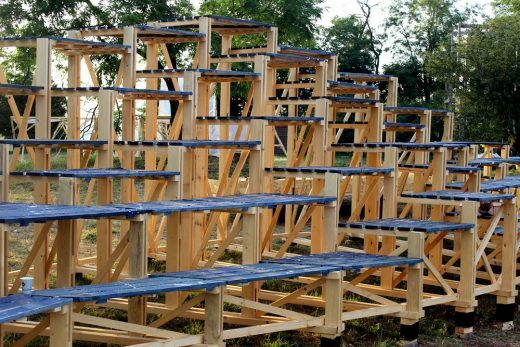 The use of environment-friendly ground screws, experimental infrared water purification equipment, the introduction of community cleanup and selective waste collection are all part of the effort to keep Hello Wood amongst the most innovative architectural education programmes. 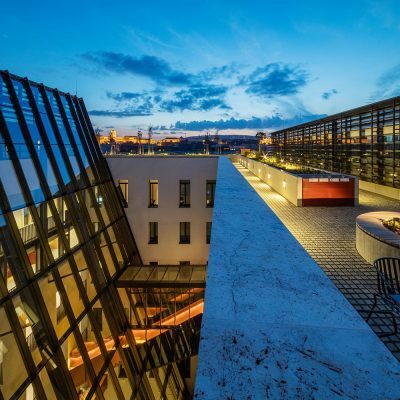 The innovative approach has been attracting the attention of the international architecture community for some time. Although participants arrive to the programme from all over the world, the private initiative is currently organised in two locations – Hungary and Argentina. 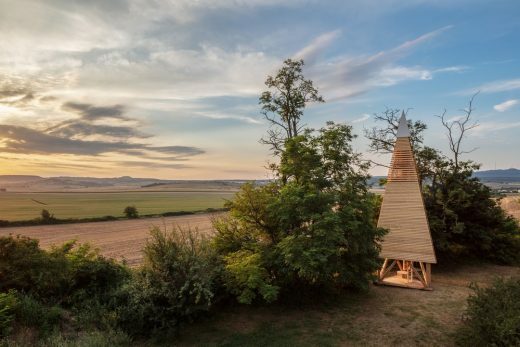 To support the programme in its international roll-out the Hungarian Tourism Agency entered into a co-operative partnership with Hello Wood this year. 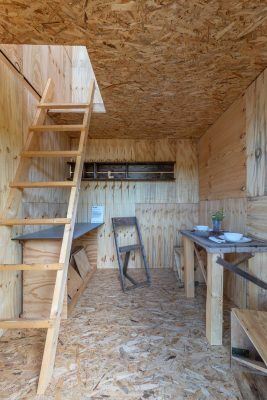 The agency is promoting local creative industry internationally and committed itself to support Hello Wood’s tiny house development. 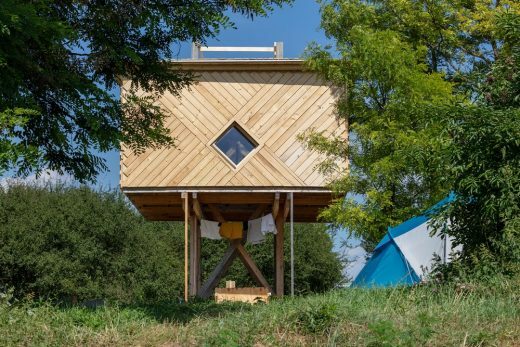 It is no coincidence that cabins were the source of such inspiration this year for Hello Wood’s curators, founder Péter Pozsár and architect Fruzsina Karig. ‘The Tiny House Movement began in America but is spreading into Europe. Building your own cabin is now a mainstream trend here’, says Fruzsina Karig. 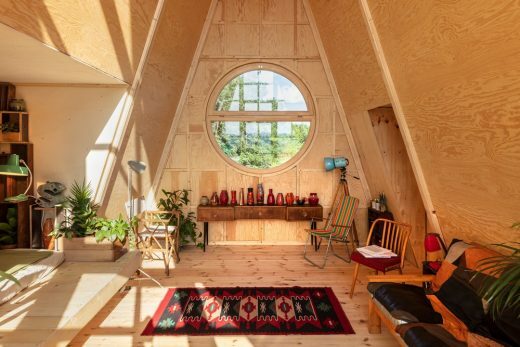 Hello Wood wants to spearhead the tiny house movement on this side of the Atlantic and is, therefore, doing its best to set the theoretical framework for this trend. Over the centuries there have always been periods when people in big cities en masse start yearning for a life closer to nature. ‘They want to retreat and take a step back from the prevailing societal structures’, says Péter Pozsár. Rousseau and Heidegger, not to mention hippies in the 1970s, all did the same. 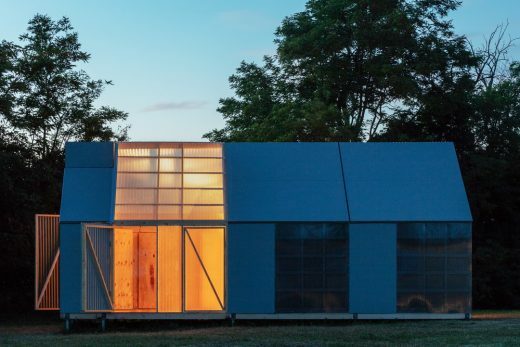 In recent years this craze has become popular among affluent people, and at the same time small-sized, temporary homes that can be erected quickly have become popular within social architecture, albeit for entirely different reasons. 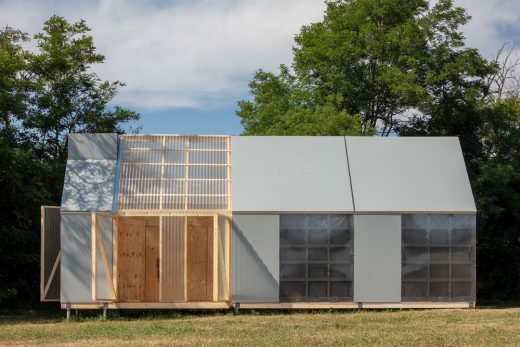 The creators of the Hello Wood camp have also been looking at the question of whether the same typology also works when functions conflict and contexts are different. 2019 will mark the 10th anniversary of Hello Wood International Summer University and Festival. Hence next year they will celebrate the decade-long community building with a new theme: Celebrations and Holidays. The event will recall the beginnings and the more recent years with new structures and ceremonial performances. Hello Wood requests the pleasure of everyone’s company who is willing to join them to recall the mood and characteristics of the past in an environment designed for community’s reflections. How can you create space for lots of people in a small wooden cabin? The Grand Cabin Club is not a lonely retreat, but a place nestled in the forest which is perfect for socialising, dinners with friends or even house parties. Even the shape of the building makes you think of cosy evenings playing board games with friends. 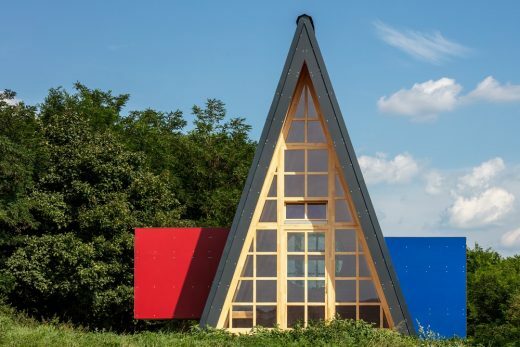 Its A-shape gives it a nostalgic feel, especially for Central Europeans familiar with the Czech-style mountain lodges which inspired its design. The Grand Cabin Club compensates for some of the downsides of classical forms. It was built using pre-fabricated, made-to-measure wooden panels by Berger Houses and its huge glass windows offer magnificent views of the surrounding countryside. The cabin can comfortably accommodate eight people, but as many as twenty people could fit inside for a party. This was made possible because the builders did not separate the central space with walls or floors. What’s more, the two bedrooms and the bathroom are in ‘boxes’ which are accessible from inside but actually joined on to the outside of the cabin. 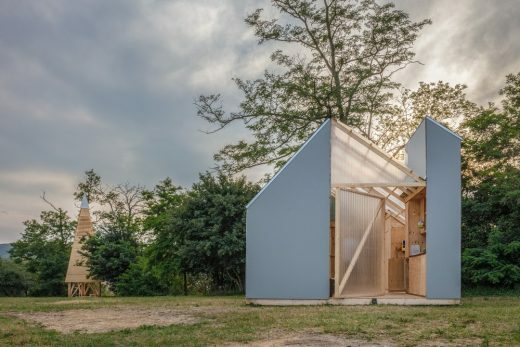 These sleeping boxes, which open on to the interior of the cabin, and the large common space evoke one of the critical aspects of the Hello Wood camps – the blurring of boundaries between community and private areas. 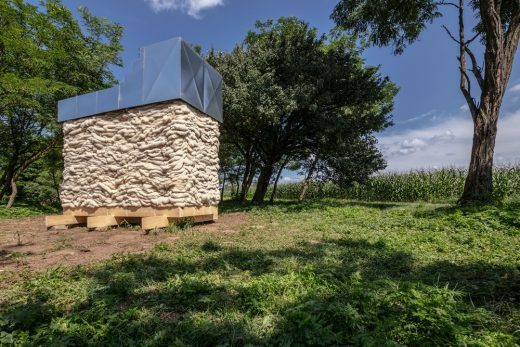 Users will be able to make use of similar environmentally-friendly cabins in the future thanks to the technology behind this contemporary Hungarian pre-fabricated house. The team had two essential considerations in mind when designing and building the Ziggurat Delivery cabin. Firstly, it needed to be a portable multi-storey building, so it is made up of two separate, portable container-sized units. Secondly, those living in the cabin, which is made from wood and Airium, a mineral thermal insulation material reminiscent of foam concrete and produced by the LafargeHolcim Group, should come into contact with the surrounding natural environment as much as possible, and their everyday lives should be closely linked to seasonal changes. For this reason, the house is fitted with large windows and the area on the ground floor for communal activities, such as cooking, is deliberately tiny to encourage people to carry out their daily chores and activities outside when the weather is nice. Ladders are used to access the upper floor, which is supported by wooden beams, and the bedroom, which has space for two beds. This is a more closed-off, private space than the ground floor and gives people the chance to relax and spend time alone. 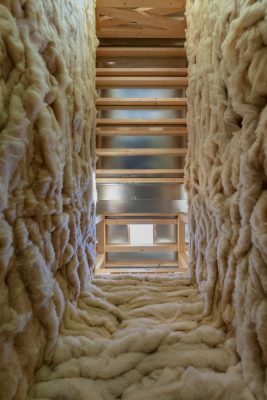 In cold weather, the warmth from the chimney at the centre of the upper level will heat the entire space. 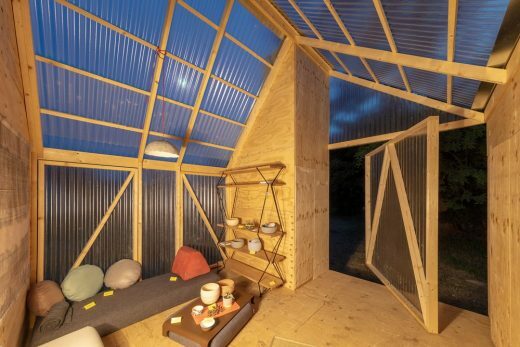 This cabin, which is both clad and insulated with wool, is specially designed for use by one person – a space for getting away from it all and getting lost in your thoughts. With positions for sitting and lying down facing one another, it is reminiscent of a psychotherapist’s room and cabin users can either take the place of the person asking questions or that of the one providing the answers, depending on whether they would prefer to think in silence or voice their problems. Two layers of wool cover this cabin retreat. The reason for this is that although water may seep through the first layer and small bugs may hide within it, the second, inner layer will always stay dry, and insects will never make it that far. 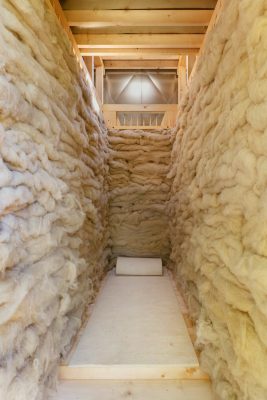 Wool is an excellent insulating material, too, and it does not just help protect against the cold, it also keeps out the heat. For safety reasons, the tin-roofed building has been designed so that there is no chance of the walls retaining heat – the warm air that enters the rooftop area escapes via a chimney-like vent and tiny holes in the wood panels around it. 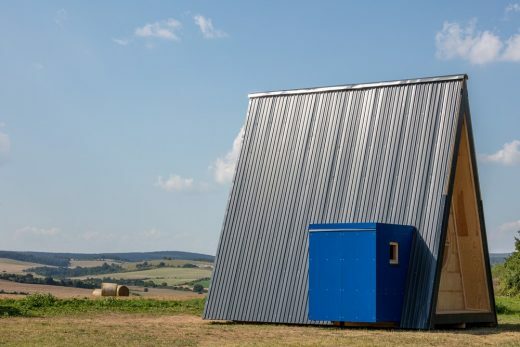 Wheels have been fitted to one side of this vertical cabin, making it highly portable and therefore allowing users to set it up wherever they like. However, the wheels are not fitted to the bottom of the cabin, but to the longest side, so it must be placed in a horizontal position before it is transported to the desired location. 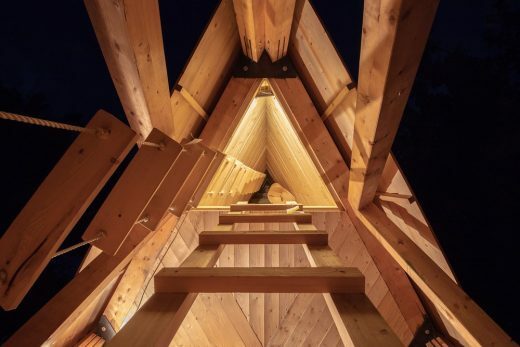 The cabin was initially put together in a horizontal position, and although the light wooden structure can be moved into vertical position using human force and ropes, the roof is heavy and must be fitted on to the building by crane. 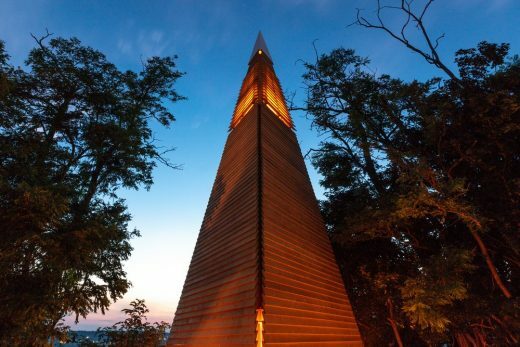 This project was unusual compared to other projects this year, as the vertical cabin was made from re-used materials. The builders worked with scrap material that had been left behind by other teams from previous years. As the whole cabin is based on the concept of mobility, it is worth taking this into account when fitting out the interior: the simplest solution is to fix the furniture to the walls. 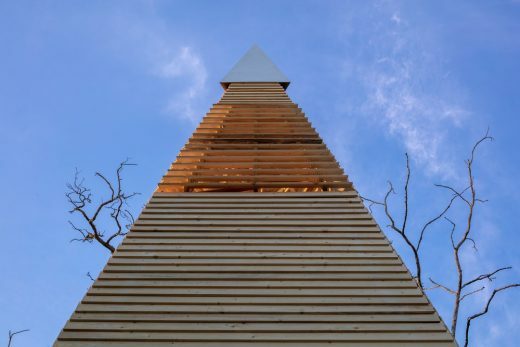 It is the small details, such as the closed and tilted angles of the sides that define the final look, minimalist form and considerable (12.5m) height of the Treehouse. As it is not a classic cubic structure, the inward-leaning triangular walls significantly reduce the interior space in the cabin. The only way of expanding the living space was therefore for the builders to increase the height of the building. It is fair to say that it is the small details that define the Treehouse, and not the other way around. The builders very much concentrated on the details before focusing on the whole. 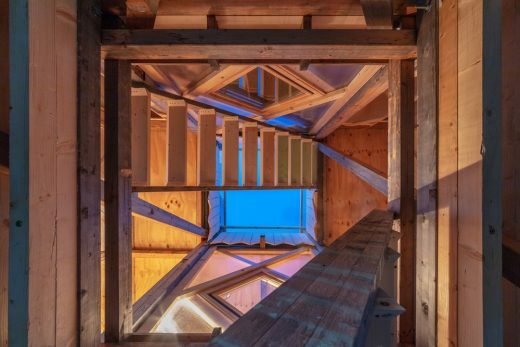 The Treehouse is a haven and functions almost like a lighthouse for lost travellers. People inside can put a light on the roof of the wood-panelled cabin to signal to travellers that they are more than welcome to visit. Although the building is open on the ground floor, the upper sections, which are accessed by a ladder, are completely closed off. It is there that weary travellers can find solitude, put their head down and escape the noise, cold, wind and other extreme weather outside. In the closed-off upper part, there are three hammock-style sleeping spaces on top of one another which are perfect for rest and relaxation. 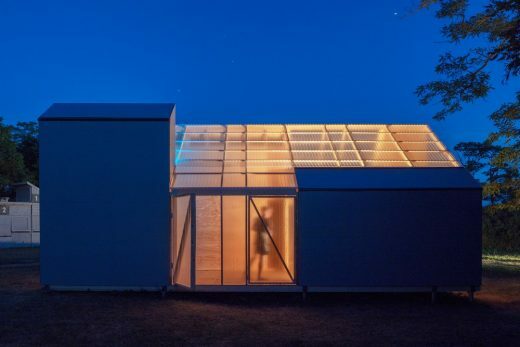 If our starting point is the notion that a house is defined by the various needs of its users, then it is a good idea to build it using separate portable modules, each designed for different purposes. It’s easy to split this cabin into its individual elements, such as the kitchen, the bedrooms, the communal and storage areas, and the bathroom. Different combinations of these transportable units can then be put back together without difficulty. 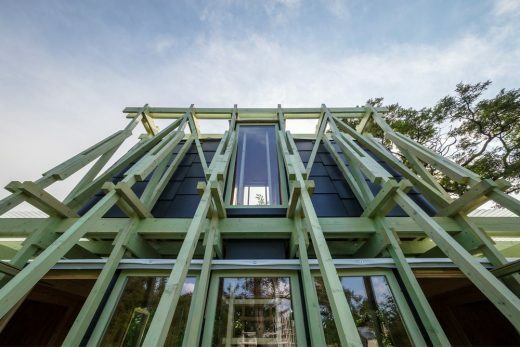 This cabin is a passive house which operates using solar energy. The builders were inspired by the Plug-In Social project in Argentina. Plug-in Social used simple solar panels to supply hot water to impoverished communities in the suburbs of Buenos Aires. 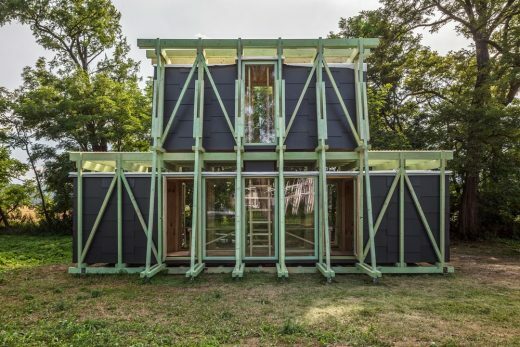 According to plans, green energy will also be used inside the Hello Wood cabin. Heating, for example, will be supplied via a Trombe wall which absorbs and stores the heat from the sunlight and then lets it into the living area through air vents. Solar energy can also be used for cooking in the ‘solar kitchen’, where Fresnel lenses help collect the heat from the sun’s rays. The communal area in the middle is covered by a transparent polycarbonate roof, under which plants could even be grown, like in a greenhouse. 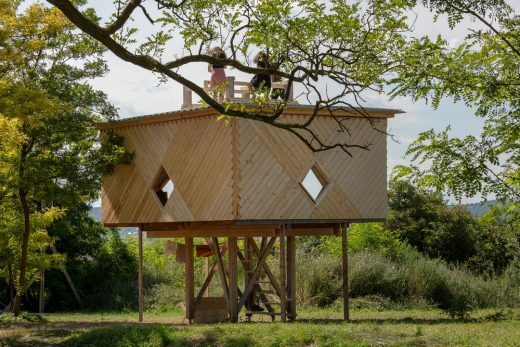 A new take on an abandoned project from a previous Hello Wood camp, this stilt house provides shade and refuge, and almost appears to hover in the surrounding landscape. Although the builders used their own ideas to improve the existing structure, they also respected its current features. This approach is in line with the architectural principle which states that a building is never finished – over time it is always transformed according to the needs of those using and renovating it. 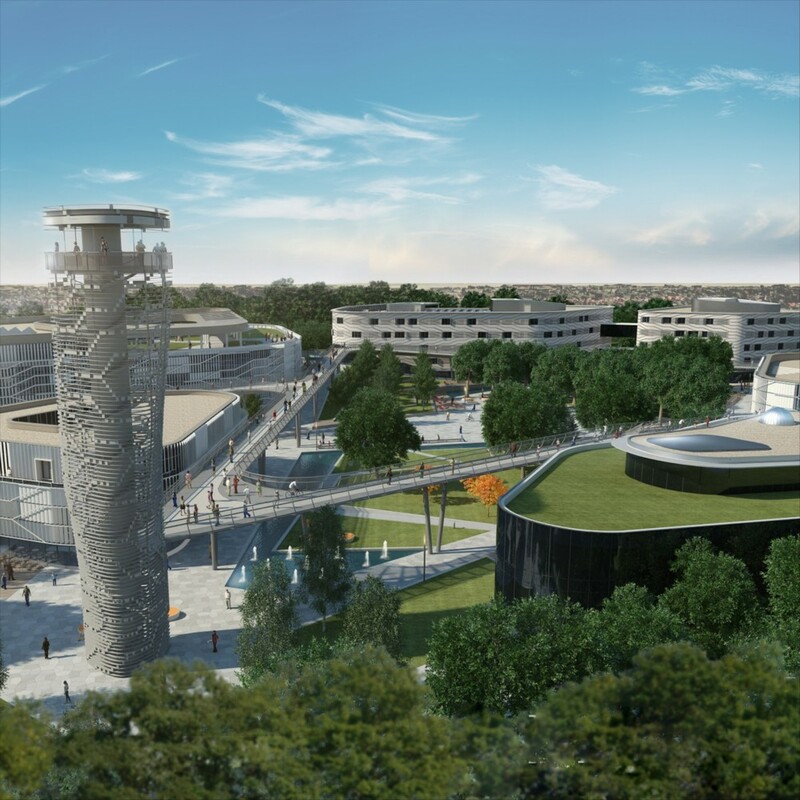 The name ‘I am a monument’ was chosen to honour the previous builders’ efforts. This year, a roof and an upper floor with side walls have been built on to the existing stilts. 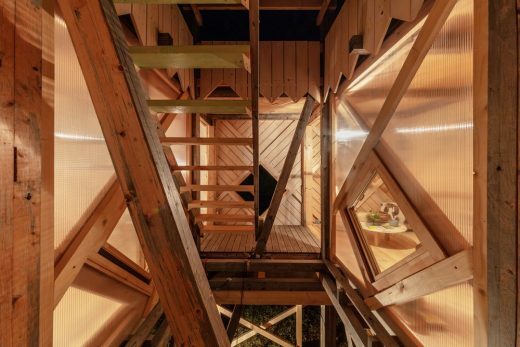 The cabin extends upwards and is designed to ensure that at ground level it interferes as little as possible with nature and that it leaves as few traces as possible. At the same time, it tries to give users as many opportunities as possible to get close to nature. While the upper floor offers a more private, protected space suitable for rest and relaxation, the ground floor is open, and daily chores can even be carried out in the open air. Last but not least, there are magnificent views from the roof. Those who climb to the top will be able to enjoy and take in a stunning panoramic view of the surrounding countryside.